When last I left you (see Part I), you were out in the middle of the forests of Alberta in -20 degree weather with nothing but the clothes on your back and a survival kit. What now? That was my question as Dudley Driscoll, wilderness survival instructor and long-time student of Mors Kochanski, led the seven of us off the beaten track in Kananaskis country. Along the way he pointed out the names of various trees and shrubs that sounded like Juniperus scopulorum and Pinus albicaulis. Who knew that one could eat Juniper berries and use Poplar buds as a breath freshener? Both priorities are meant to keep you alive and alert enough to think straight. It should come as no surprise that your brain is your most important tool. It’s what keeps you from getting in the situation, prepares you for when you do, and gets you out of the situation. The gift of survival training is how it goes back to the fundamentals. When you read the Survival Credo, you get that it really is a Life Credo. It’s simple: rest, think, act, be thankful… if only we could do that more! 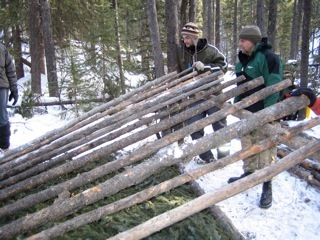 Upon finding a relatively level location protected from the wind, we started to build what is called a “lean-to”. The pictures will make it pretty obvious why it is called that. 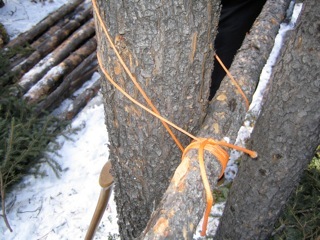 Shown below is the main frame on which to lean all the logs. This shelter was being built for six. A one person shelter would be much smaller of course. The nylon cords came in handy for supporting the main beam. To tell you the truth, it would take me a lot of tries to tie this properly. Like everything else in this course, you have to practice, practice, practice to be able to do it in a crisis situation. The next major task was building a mattress. Comfort is certainly one reason for making a bed. More important though is keeping the body insulated from the ground which rapidly conducts heat away from the body. 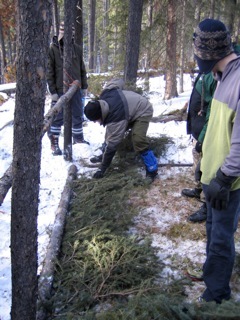 For this purpose, we used spruce boughs as the bedding material. A depth of four finger-widths is the ideal. Believe it or not, the bed was comfortable and warm! For those concerned about the trees, I’m told that they will survive since the lower branches tend to die off as the spruce grows taller. The bedding finished, we now leaned a number of logs against the main beam. This formed the roof of the shelter. For a single-person shelter, the leans would be steeper. Now for an ingenious design element by Mors Kochanski. 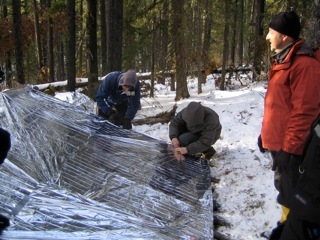 Instead of using the usual spruce boughs or bark as the roofing, the emergency space blanket in the survival kit was used to cover the roof. This makes the shelter far more efficient at reflecting heat to the sleeping survivalists. With a plastic sheet to cover the front entrance and a fire out front, we had essentially built a greenhouse. 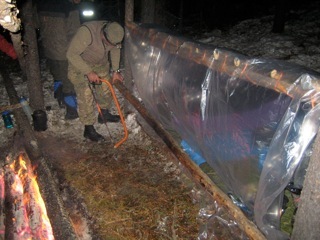 This is what Mors calls a Super Shelter and it is highly efficient at retaining heat which means less firewood required. Click here for a description of other types of shelters. Although a few steps in any direction away from the shelter was a frigid -20 degrees, inside the shelter was a tropical paradise. I slept through the night in my t-shirt and actually wished I could sleep with less… if it wasn’t for the spruce bough bedding. Proud to have cut down a tree with a knife. Unfortunately, I didn't realize it was a live tree. Well, we put it to use as a crane over the fire. There were some drawbacks unfortunately. Someone has to keep the fire going. Early in the night, the shelter temperature would oscillate between 15 degrees and 40 degrees until we learned how to manage the fire better. At this point, you might be wondering how we were able to get the logs in the first place. Fortunately, Dudley brought a bow saw which greatly facilitated the work. 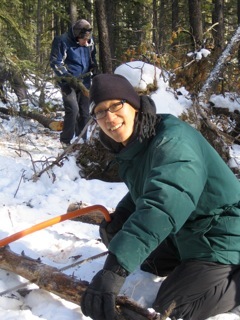 But absent a bow saw, it was possible to cut down a tree with just a knife as I proudly did in this picture. I confess however to cutting down a living tree which as you know is useless for firewood and generally bad ecological practice. It looked lifeless though…. oops. Dead trees though could simply be kicked over and broken by levering it between two trees. 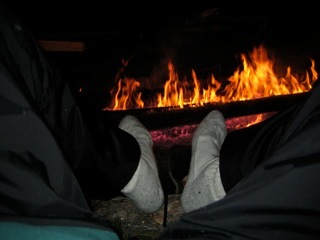 Or alternatively, a fire can be used to section a log. Fire… it must have taken thousands if not hundreds of thousands of years for homo sapiens to figure out how to master fire. The closest I have come to starting a fire is lighting a candle or using a magnifying glass to burn paper, so I was eager to learn more. 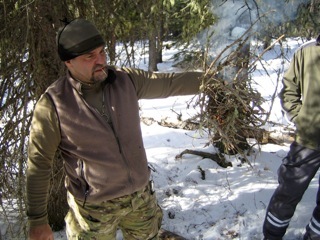 As this was only the basic course, we learned how to start a fire with a match. In later courses, one would attempt to start a fire with progressively more difficult methods: half a match, an artificial match, flint and charcoal, bow drill, and so on. For us, the building block of a fire was the twig bundle… a mixture of dried tree sap, yellow grass, dead branches and pine needles folded in together… that could be held in the hand and lit by a match. It can be surprisingly difficult to find the right materials. Nevertheless, I am proud to say that I was able to light my bundle in the first attempt. Prior to this, we had also been collecting firewood. 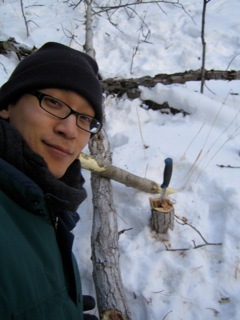 Food may be hard to find in the winter, but dead wood was plentiful. Within an hour or so, we had enough person-length firewood for the whole night. We wanted to build a parallel fire where the logs burn length-wise. The reason was simple. A parallel fire would heat the entire length of the shelter and whoever was in it. Starting with the twig bundle we lit our first stack of logs. 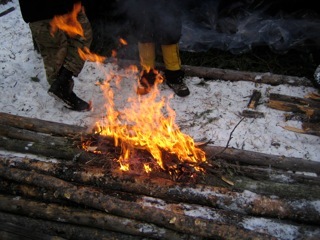 Once the fire got going, we could melt snow for water and cook the grain mix that we had brought. We were surviving in luxury! For other types and uses of fire, click here. It’s clear that a lifetime could be spent learning the ins and outs of the wild. Building signal fires, understanding mental processes, making ropes, studying plants, constructing tools… and much more. You don’t know everything, so stop pretending. There is no room for fantasy or speculation. Test your ideas against reality. To be good at it, practice, practice, practice. Life is neutral. It is neither for nor against you. I think I’ve caught a glimpse of how the Inuit see life as the teacher. The dead of winter would probably be the most ruthless and unforgiving teacher of all!